While most knee injuries are not life threatening, they do tend to result in significant disruption to one’s life and a great deal of physical pain and suffering. 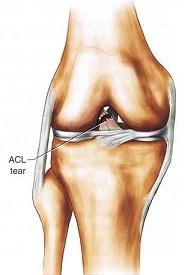 A tear of the anterior cruciate ligament (ACL) is one of the more common knee injuries caused automobile collisions. If you have sustained an ACL tear because of another motorist’s negligence, you are entitled to significant personal injury compensation. Contact the Raleigh car accident personal injury attorneys of Maginnis Law at 919.526.0450 to discuss your knee injury case. You may also email one of our lawyers directly by using our contact page or emailing us at info@maginnislaw.com. The ACL is one of four ligaments that help stabilize your knee by limiting its movement. ACL and other car accident knee injuries frequently occur because of sudden impact between the knee and some portion of the automobile. The symptoms of an ACL tear include pain on the outside and back of the knee, swelling, loss of strength and stability, and limited movement. You may also hear a loud “pop” noise when the knee injury occurs. If you present with such symptoms following a car accident you should immediately go to the emergency room. Recovery from ACL surgery commonly takes a year or more. If you are unable to work and earn your normal compensation, or have to use a significant amount of your leave time, you are entitled to damages for lost wages or loss of wage earning capacity. You will also be entitled to damages for the physical, mental, and emotional pain and suffering associated with the ACL tear and the associated recovery period. Medical bills paid by your or your health insurance company also must be paid by the at-fault driver’s automobile insurance company. In many cases, your personal injury damages may exceed the third-party liability limits in the at-fault driver’s automobile insurance policy. If this is the case, the attorneys of Maginnis Law will work with you to determine whether there are any other insurance policies providing coverage for your injuries. For example, you may be entitled to additional personal injury compensation under your own automobile insurance policy’s underinsured motorist coverage. The Raleigh automobile accident attorneys of Maginnis Law, PLLC offer free consultations for all personal injury claims and are happy to discuss you claim over the phone. You may reach one of our personal injury civil litigation lawyers at 919.480.8526. Our attorneys regularly handle car accident cases in Raleigh, Cary, Durham, Chapel Hill, Apex, Morrisville, Clayton, and Wake Forest. Maginnis Law handles all car accident knee injury claims, including ACL tear cases, on a contingency basis. You pay no attorneys’ fees unless you recover for your torn ACL. We practice in the courts of Wake, Orange, Durham, Alamance, Johnston, and Chatham counties and you may submit email inquiries via our contact page.